Smoked salmon is one of those things I grew to like over the years, and every now and then I get a craving for it. On a bagel is by far my favorite way to enjoy it, but I like mixing it up a bit by swapping out the traditional cream cheese for mashed avocado with lemon. Not only is it healthier, but I think it packs more flavor. Everyone says you eat with your eyes first, and you’ll be hard pressed to find something more colorful than this! 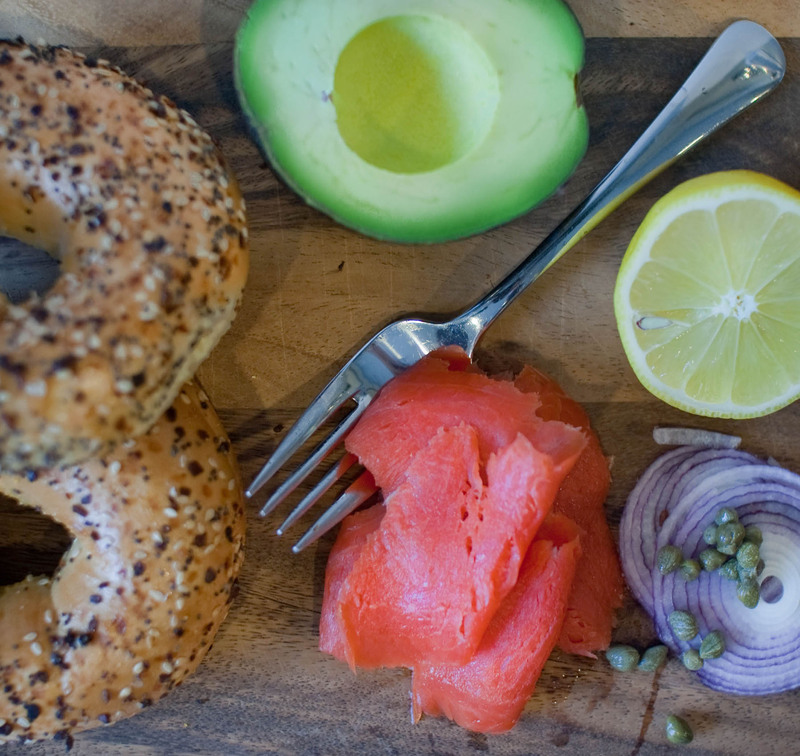 Schmear each bagel half with avocado spread, then top with smoked salmon, red onion and capers. (I like eating mine open-faced.) Finish with a squeeze of fresh lemon and a twist or two of freshly cracked black pepper. I would love nothing more than that for breakfast! I’m good! You know I would love this colorful, fresh, and beautiful spread you got going here. I love lox. And then the creamy avocado and perky capers just puts it over the top. Wonderful! Great point! I never thought about that, but you’re definitely right. Thanks for sharing! This looks divine! I would eat this with pleasure! really looks amazing! I am a diehard smoked salmond lover. I’ve often said that if someone told me I could only eat one food for the rest of my life, I would pick smoked salmon. Not chocolate, surprisingly! This is a delicious recipe! Ooo- I have never had it with Avocado spread. That is a great idea! Oh these look so good. It is a quick recipe, I love that! gorgeous photos! I have been craving lox and bagels for a while now, I even went to Montreal to get Montreal bagels and have been forgetting the salmon. Thanks for the reminder, this is sooo yummy. Summery perfection on a bagel – YUM! The colors draw me in! Now I want one for breakfast today…I’ll have to make that happen! You have just put all my favorite things together…why have i not thought of this?!? You are a genius! Yum – smoked salmon and avocado are two of my favorite foods. This is making me really hungry!